LESS THAN 2 MONTHS TIL SPRING!! From your driveway to the highway...We've got you covered! Owner/Technician at Dimension, Roy Wilson will give you some helpful hints here to help you keep your vehicle running at its best, and help you figure out what may be wrong if it's not! Do you have a question that you would like Roy to answer? Maybe a subject that you would like his input on? Just send Dimension an email contact here with your topic or question! My check engine light goes on & off sometimes, but the car runs fine. I am due for inspection. How do I insure I pass? My tires have a lot of wear on inside edges. Can I rotate the tires to correct the wear, and also help with the drift I feel on the highway? Answer: Absolutely NOT! First, tires may need replacement if really worn in spots, and the alignment is off if you are seeing that kind of wear. So first, let's check the alignment and suspension for any issues, then rotate the tires if they are not too worn. Stop by and let us check out and advise as to what steps to take to guarantee a safe ride. Check out our alignment tab on the right, for more details! My check engine light is on. I am not due for inspection for awhile, can I just drive it? Answer: It depends! It could be any number of things, from a simple thing like a lose gas cap to something much more serious, with potential to do damage to your engine in a short time. IF you light is in, make an appointment, or just stop by, and we can use our diagnostics to see what the issue is, and let you know how soon it needs to be fixed, or reset the light for you. Why do I have an odd strong smell in my car? It isn't an exhaust smell, so not sure what to do. Answer: Sally, it can be something simple or simply annoying! We have seen customers whose car have become a home for small rodents and animals, and their nests can make for quite a smell! Let a professional check it out, and hopefully you won't need an exterminator! My radiator has a small leak, can I patch it to get by? Answer: ABSOLUTELY NOT! Many of the radiator tanks are plastic, and repairs are temporary at best. With cold weather conditions, this is not the time to do a RubeGoldberg fix on something as important as your heating system. Most companies have great warranties on their products, so no reason to patch it...fix it right and fix it once! "IS there a difference in quality of brake parts from a dealer vs. aftermarket?" Answer: A BIG YES AND NO!! You are not required to use dealer parts, despite what you might hear, but it is good to do your homework. We use only top quality parts that have a 24 month, 24,000 miles warranty, to ensure you will have a long life on your brakes, even if you are tough on the pedal. Some warranties can be deceiving as well...they may NOT cover 100%, or may not cover the labor. Our warranty covers both parts and labor, so if there is any failure, it costs you nothing. It is rare, but it can happen, and we stand behind what we sell. This warranty doesn't just apply to brake parts, but many other parts as well. Look for your station, and make sure it is listed here, to ensure you are getting the best quality gas for your car. Remember, this is one of the biggest investments you will make in your lifetime, be sure to treat it with care, and it will last! 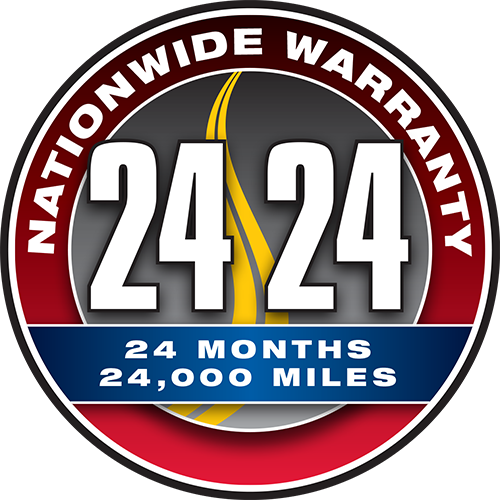 CHECK OUT OUR WARRANTY FOR MOST PARTS & SERVICES...NO GIMMICKS, NO EXCLUSIONS! THERE IS NO NEED TO GO TO YOUR DEALER...WE CAN PROVIDE YOU THE SERVICES AND WARRANTY THAT GOES WITH IT! ALL IT TAKES IS A SIMPLE PHONE CALL! Ask us for details, and how it applies to your services. REMEMBER, Preventative maintenance is a key component to a long life for your vehicles! WARMER DAYS CAN FOOL US, BUT NOT OUR VEHICLES! WINTER IS STILL HERE, AND COOL WEATHER MEANS CHANGES IN YOUR VEHICLE. *With cooler temps, you may find your car is running rough, or riding rough. With cooler temps comes a different inflation of your tires. If you need a tire check, please stop by, and we can check it for you. Seasonal/Routine maintenance will keep you running smoothly, save you money and even to keep up your trade-in value if you are looking to buy new. WINTER WEATHER BRINGS EARLY DUSK, SO WATCH OUT FOR DEER, BEARS AND WILD ANIMALS! AND LET'S NOT FORGET THE SNOW, SLEET AND THOSE DREADED POTHOLES!! Try to avoid potholes of you can, they can not only mess with your alignment, but also with tires, and assorted suspension parts. We recommend that all vehicles have an alignment check a minimum of once per year, or if getting new tires, ALWAYS get an alignment after! Turn on your HEAT and blast it! If it isn't HOT within 5-10 minutes, there is a good chance something is wrong. A small fix can be the difference between a comfortable and a nightmare ride! COOLER temperatures can mean extra stress on your vehicles. Stop by and let us do a quick check of your vehicle...it takes minutes and can save you on repairs "down the road". Changes in temperature can cause hoses and clamps to loosen, and fluid leaks.﻿ Make sure your coolant reservoir is filled to the proper level, or better yet, let us do it for you. NEVER run straight water in your radiator, and NEVER open a hot radiator cap! Check your battery. If your battery is 3 years old or older, REPLACE IT! Batteries only have a limited life, so don't wait for that one morning when it won't start. The cost of a battery is a lot less than a tow, and won't ruin your day! A SET OF JUMPER CABLES IS A GREAT INVESTMENT, and you can find them at reasonable prices. And despite the fact we are in the business, we STILL have AAA! We may never use it, but it is a great safety for anyone when travelling. Check your belt(s). Temperature changes many times wreaks havoc on your belts, and a broken belt can lead to disaster on the road. A simple check can save headaches on the road. Check your lights! Often times forgotten until they are not working. Don't just look for bulbs that have burned out. Yellowed or cloudy lights can diminish your visibility to oncoming traffic. We have standard size bulbs in stock, and can check your lights and bulbs with any service. AND YES, we can buff you headlights, and they look like NEW! Replace those wiper blades! Like batteries, these are items most often ignored until needed. The winter weather causes them to get brittle, whether used or not. You can lose your ability to see, but is simple fix! With the downpours, a clean windshield is a MUST! We can change them while you wait, or when in for service, we will check them & advise if needed. Fix your brakes. A brake check and possible replacement is a good thing to check each season as an easy way to keep track. Don't wait until you hear or feel it, a simple check is all it takes! IF you are hearing a noise when braking, IT's TIME...don't put it off, as it may do more damage, and require more parts than originally needed! Change your oil & filter. So minor, but so often overlooked by many. This is key to vehicle life! Want to get more out of your vehicle, use synthetic oil! We have cars with 200,000+ miles, 300,000+, and even 400,000+, including our own. Maintenance is the key to the life of any vehicle. Let us help you keep your cars and trucks running for miles and miles! BETTER THAN DOING IT YOURSELF...LET US DO IT FOR YOU! MAKE YOUR APPOINTMENT TODAY & WE CAN MAKR SURE YOU ARE ROAD READY FOR ANY SEASON! One of the worst things you can do is let your car sit without driving for long periods of time! Start it up, go for a ride, stop by & let us give it a "check up"!